Safety is the number one concern when looking to buy new brake pads. Especially since there are no federal regulations on brake pad manufacturers. With all the options on the market today, it can be hard to decide which ones are going to offer the best safety features. The best brake pad manufacturers are serious about safety. They dedicate a lot of time and effort to make sure their pads meet the highest standards. The best way to do this is through research, testing and innovation. While brake pads have certainly become safer through testing and standards, other advancements have been made as well. Quality, for instance, has become just as important as safety in today’s brake pad market. The best pads offer longer life and better performance in addition to safety. The best pads are not always the most expensive, as cost to manufacture is relatively low, but the best pads are decided by design and performance factors. The best manufacturers strive to improve their products and meet even higher standards for their customers. These ACDelco ceramic brake pads are from the Professional line of products ACDelco offers. This line of pads comes with a quality assurance that is based on engineering and testing. In fact, ACDelco Pro brake pads are the most thoroughly tested aftermarket pads on the market. These pads are ceramic and semi-metallic, so they will be able to perform under a wide range of conditions and uses. The ceramic makeup is also known to leave less brake dust on your wheels. This pad also uses some organic materials. The makeup of the pads is developed to vary from vehicle to vehicle. The extra attention paid to the materials that made up the stopping surface of these pads is done so that every pad provides safety and reliability for its vehicles. The makeup is determined by the vehicle’s specific characteristics and common braking conditions. The backing plate of these pads is integrally molded to the pad. The focus on bonding ensures bond integrity and reducing the possibility of separation. Backing plate bonding technology has advanced in part because if a pad and plate are bonded solidly there can be less friction and noise. The ACDelco Pro backing plate is also manufactured in a way that allows for ideal pad movement in the caliper. This reduces possible pulsation and chattering because the pad doesn’t fit or function correctly. Special attention has been paid to the slots and chamfers of these pads as well. They are designed to help to diminish noise, vibration and braking harshness. It is very important to ACDelco that their pads meet specific standards of testing. These pads meet the to D3EA and SAE J2784 standards for braking effectiveness. This standard rating means that the people at ACDelco paid a third party to test performance of the brakes to ensure they are of the highest possible effectiveness. The point of these tests is to measure braking effectiveness, wear and vibration factors. The D3EA testing is also performed specifically for the vehicle the pads were manufactured. This means the pad for your vehicle will have passed the D3EA standards testing while on your model vehicle. ACDelco is known for striving to meet this standard since it came into existence. These pads are available for 95 percent of the registered vehicles in North America. User reviews of these pads are highly enthusiastic. Reviewers claim great improvements in the lasting quality of these brake pads. Some claim that despite using these pads on full size pickups and SUVs, they have gotten over 100,000 miles on a single set of pads. ACDelco works extensively with GM manufacturers to provide a quality part for those vehicle manufacturers, as well as for non GM vehicles. These pads are also above the standards set for aftermarket OEM parts on all vehicles. This brake pad also comes equipped with premium shims. Shims are an important part of a brake backing plate. Shims are used to suppress noises while braking. Shims are the part of the brake pad that maintains consistent contact between the brake and rotor. A quality shim can reduce noise and uneven brake wear. The shims are specifically designed to keep your braking smooth and safe right out of the box. The brake pads also come complete with brake hardware in the box. Many cheaper brake pads skimp on these almost always necessary parts, which can cost an additional $10 to $15. These are also the heaviest pads on the list at 5.1 pounds. This is a significant weight difference from the rest of the pads, which do not weigh over 4 pounds. The ACDelco Professional brake pad warranty ranks at the top of the line with limited lifetime replacement for pads and shoes direct from the manufacturer. This warranty means the brakes will last, or they will be replaced for free. Considering everything that is behind every set of these brake pads, a person would be hard pressed to find a higher quality pad. The ACDelco Professional ceramic brake pads account for so many factors and suit such a wide range of applications they are at the top of the list. The ProACT Ultra-Premium brake pad line from Akebono is known to have a very desirable brake effect. Akebono manufactures pads used by car manufacturers. They know how to make a brake pad that makes braking feel like you would expect from a brand new car. Smooth, steady stopping power with no vibration are a huge feature of these pads. This braking power is combined with great responsive pedal control. They also have great response in panic braking. Akebono uses very high quality brake pad materials and a sturdy steel backing plate on these pads. The backing plate material also helps reduce noise and wear. Akebono claims these pads are the optimal upgrade from standard metallic pads. The engineering of these pads addresses braking performance across many variations of driving. This includes testing and analyzing of the performance of these pads as they are applied to each vehicle they are manufactured for. Akebono is very proud of their tireless efforts to research and develop the very best brake products. These brakes are designed with a focus on smooth and consistent braking. They have less brake fade, which means that prolonged braking will not cause you to lose braking effectiveness. This is a common problem with inferior brake pads, especially in areas with long downgrades. Customer reviews support the claim Akebono makes about the ProACT brake line offering great braking. 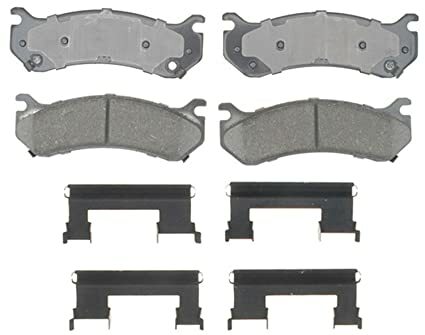 These brake pads are OE, or OEM certified depending on the vehicle you buy them for. This means that the pads are either the exact ones used during the manufacture of your vehicle, or are certified by the manufacturer of your vehicle to meet the requirements of the vehicle. ProACT ultra premium brake pads are said to be the ultimate upgrade from original pads from the manufacturer. The step up in price to the ceramic pads is offset by the performance as well as by the durability. These pads last longer than semi-metallic pads and also cause little to no brake dust accumulation. 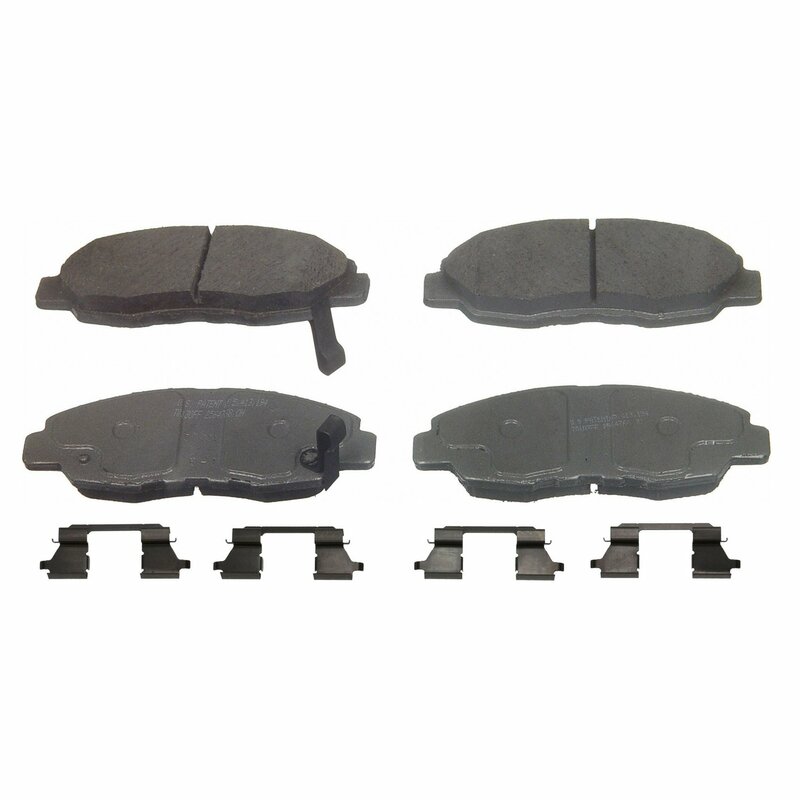 Not just a ceramic brake pad, these brake pads are manufactured with superior materials that minimize rotor wear. The materials are easy on rotors and require no break in process. This means you have full braking power as soon as you install them. You won’t have to bed them or wait to see how they feel. The ceramic based pads produce less vibration and provide a smooth quiet ride. The ProACT pads are made from a mix of ceramic and some semi-metallic materials so you get the best of both worlds. The semi-metallic materials used in these pads do not include significant copper material. Akebono has already met the copper reduction efforts set forth for 2016 in these pads. The pads also come with stainless steel hardware and high temperature molly lube. The backing plates are powder coated for durability. The manufacturer warranty for these pads is a full replacement warranty that covers 90 days from purchase and 30 days from installation. The Bosch QuietCast Premium brake pad has an OE design for slots and chamfers. This brake pad design ensures fit and function on 95% of vehicles on the road today. It has a fool proof shim feature, and material composition that varies depending on vehicle application. The QuietCast Premium features rubber core-shims that are pre-molded into these pads. The shim on a brake pad dampens vibration and noise from your brakes by creating a consistent, smooth surface of friction between the brake pad and rotor. Shims in general are often misused and rendered useless when the shims detach from the backing plate. Bosch has developed a product that eliminates this problem which exists in many other brake pads. The QuietCast Premium is manufactured with a pre-attached, rubber core shim. This unique feature is not a novelty. The people at Bosch use heat and pressure cure processes that ensures the highest quality bond possible between the rubber shim and the metal backing plate. The rubber shim itself is of a superior quality. It is made of a high quality, durable rubber and is treated to resist drying, cracking and melting. The brake pads are ceramic, which means longer lasting pads. The other materials used in the linings of the QuietCast Premium pads are non-asbestos organic (NAO). The exact composition of each pad is decided by what vehicle that pad will go on. NAO materials include fiber, glass, and rubber. These materials typically mean a softer brake pad, which means less noise. Softer pads can also mean greater stopping power compared to conventional brake pads. Bosch involves itself closely with every facet of its QuietCast aftermarket pads. They are very involved in R&D in the braking field. They have a team of engineers dedicated to testing all friction materials and formulations to make sure your vehicle’s brake pads are built of the ideal materials. Bosch QuietCast brake products are manufactured with the aspiration of being at or above OE standards for both fit and performance. These pads drop down in weight from the ACDelco Pro and the Akebono, weighing only 3.6 pounds. They also come with brake hardware and synthetic lubricant. If you are looking for quality aftermarket pads that are going to get the job done without spending an arm and a leg, the Wagner ThermoQuiet pads offer a lot of features for a relatively small price. In addition to the competitive price, the new technology in the ThermoQuiet ceramic pads makes them a viable budget option for this list. The Wagner TQ’s have been redesigned to be 35 percent quieter and have 15 percent more braking power. They are also now longer lasting and produce little brake dust due to ceramic braking material. The Wagner TQ uses special Integrally Molded Sound Insulator process that makes their pads all one piece. The backing plate, friction material and a sound insulator are formed into one, which distributes heat and friction throughout a much larger area of the brake pad. This makes the Wagner TQ a very quiet brake pad, and a considerable value. The TQs are a low cost ceramic aftermarket pad with a twist. The people at Wagner have researched brake pad materials and come up with their own Wagner® OE21 friction material. This material is supposed to offer all the benefits of the old copper infused pads without the environmental after effects. These pads have raised stopping power and noise and vibration standards with their OE21 makeup. These brakes are also longer lasting, and have a 24 month or 24,000 mile manufacturer’s warranty. The Wagner TQs are readily available and will suit the needs of the average driver. They also come with brake hardware right in the box. At 3.1 pounds, these are the lightest brake pads on the list. When you look at brake pads, the big consideration is what they are made of. All the above pads are ceramic based. Ceramic has become a very popular upgrade material to metallic pads because they are longer lasting and leave little brake dust residue. However, softer NAO materials are often used in high performance cars due to their braking characteristics. If you are concerned about environmental effects of copper, some brake pad manufacturers have already met proposed copper reducing standards. In general, you can’t go wrong with ceramic pads, but consider the alternatives. Your driving style may lend itself to a different brake material. A good warranty can be hugely beneficial. Often times you get the good, better, best option at the parts store. If you pay a little more you get a better pad with a better warranty. This warranty often gets used due to circumstances involved with daily use and installation. While most of the pads above will last a tremendous amount of time, if you shell out top dollar for pads only to find them worn out in less than a year, that warranty could come in very handy. Manufacturers’ warranties can also be indicative of how much faith that manufacturer has in its product. Replacing brake pads is not always the only brake componenet you have to consider when it comes time to fix your brakes. Choosing the best brake pad often coincides with the rest of the job you are doing on your vehicle. If you are replacing rotors, or even calipers along with your brakes this could significantly affect your decision. While you can try any number of configurations for brakes and rotors, you want them to work well together. If you are driving a custom vehicle, for example, you wouldn’t put budget pads on top of the line rotors. You may visit at TheGaragely.com to know more about brake rotors. Tricked out rotors often have holes drilled in them for appearance as well as function. You don’t want to put a cheap brake pad on that might wear out and damage the high end rotors or even calipers. If you are paying a mechanic to do your brakes, you may have significant extra cost added to your brake project. While many mechanics will offer higher end brake parts, most also mark up the products they sell. Add this to labor costs and you have started down an expensive path. If you have no tools to do the brake job yourself, this may end up being just as expensive as having the pads installed professionally. In either case, dropping down to the budget option above for your vehicle may make the most sense. The brake pad market is filled with manufacturers that are trying to set themselves apart. Most of the best pads out there today not only meet the highest standards, they have been manufactured to last. The best pads on our list have focused on one or more areas of development in addition to meeting standards. Many have specialized features that you would not find on the average pads you buy at the parts store. Ceramic braking surfaces dominate the list of best pads because of the lasting quality and the low brake dust factor. Some organic and metallic compounds get mixed in from each manufacturer as they see fit to suit specific vehicles and driving factors. The design of the pads, both front and back, make a big difference in quality. This is evidenced especially in vibration, noise and harshness dampening. Brake pad manufacturers focus on reducing noise, vibration and harshness in braking as well as improving safety while braking. The manufacturers that make the best pads spend tremendous amounts of time in research and testing of their pads. Meeting and exceeding standards in the above categories is hugely important. When you buy the best brakes you know you aren’t getting a generic braking product, but one that has been tested on your specific vehicle.